Visiting Hampi in Southern India is a popular way to bridge the gap between Bangalore and Goa or Mumbai. The picturesque little town is set by a river and boasts some of India’s most ancient temples. There are lots of things to see in Hampi and it can be difficult to figure out which ones are worth it. So here’s our guide to the best things to see in Hampi and how to get there. The best way to get to Hampi is by overnight bus or train from Mysore, Bangalore, Goa or Mumbai. If you’re travelling to Hampi with public transport you will be dropped in Hospet and will need to take a rickshaw the final 20kms to Hampi town. This costs around 200 INR. If you are continuing north, check out our full Rajasthan itinerary with all the must-see places. Most accommodation in Hampi is not online. You can look on booking.com to see what is available but the options on there aren't great just wait until you get to the town and have a look around. There are two parts of Hampi. The local town and what is known as ‘hippy island’ – a tourist hangout filled with hostels, cafes and dreadlocks. Depending on your interests you can decide on where you’d like to stay. We opted for the local town and had a comfortable stay at Archana Guesthouse which had incredible views over the river. To get to ‘hippy island’ you’ll need to take a trip on the world’s most dysfunctional boat service. One boat carries a load of tourists to the other side and then returns empty to get the next lot, while the other boat works in the opposite direction. The boat leaves when it’s packed to capacity and costs 20INR per person (30 if you have a backpack) for the aprox. 45-second journey. The last boat leaves at 5:30 pm both ways. If you choose to stay in this part of Hampi try Goan Corner or Bobby’s Place. There are no ATMs in Hampi so you’ll need to bring enough cash for your stay. If you get desperate there are places that will exchange most foreign currencies or allow you to take out money using your credit card for a 5% surcharge. Chances are if you’re visiting Hampi you’re interested in seeing some of the ancient ruins that make this place famous. Most of the attractions in Hampi can be seen in one full day or two more relaxed days. The main temples require a ticket (the same one for all of them) which costs 500 INR for foreigners or 10 INR for Indians. There are three ways to make your way around these temples in a day. The easiest is by rickshaw tour. Depending on your driver’s level of English they can also act as a guide. We paid around 300 INR per person but this may be harder to negotiate if you’re only one or two people. You can also hire a moped for the day which gives you much more independence and can be fun for groups. We were quoted around 250 INR for the day but as always in India, this is negotiable. If you’re feeling brave and aren’t in Hampi in summer you can also hire a bicycle. This is a fun option but it was around 35 degrees Celcius when we were there so we decided it might be uncomfortably hot. 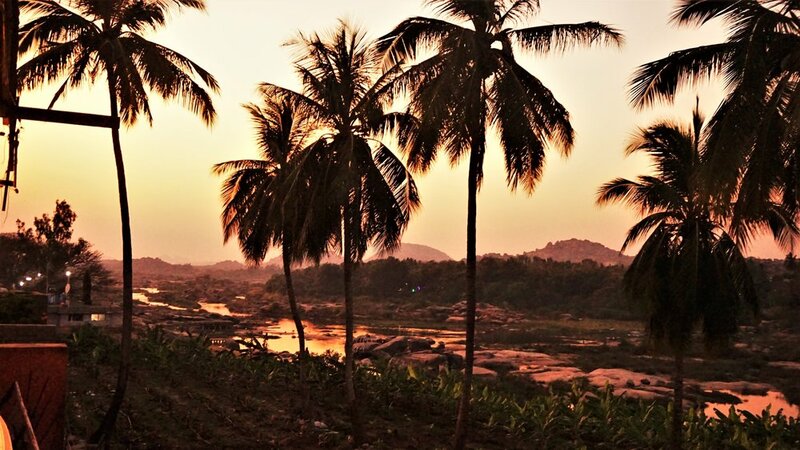 There are two places to see the sunset in Hampi. Because the boats stop running before sunset you'll be forced to watch it from whichever side you're staying on. On the main side you can walk up behind the Sri Virupaksha temple and on the hippy side the Hanuman temple mkes the perfect place to end your day in Hampi. Disclosure: It’s not a waterfall. I don’t really know how it got this name but it’s definitely a swimming hole. Super refreshing on a hot day but it can be a bit of a mission to get there. We took a rickshaw to the end of the road (around 2km) and then needed to pay a local guide to show us the way through the banana plantations. Walking from the town is an option but you’ll need someone to show you the last part. Mango Tree Restaurant - great variety of affordable food. Good service and nice environment. Goan Corner - Hippy side of the river with decent food. Gopi Rooftop Restaurant - Relaxed rooftop setting with a good range of food. Good smoothies. Don’t eat at - German Bakery on hippy side. This place was overpriced with terrible service and really average food. I don't recommend it. All the information you need to plan the perfect itinerary for Rajasthan. Includes the best places to visit in Rajasthan, information about transport and sights you can’t miss on your trip to Rajasthan. All the must-see attractions in Udaipur as well as information about places to stay and eat. Plan your trip with these fun things to do in Udaipur, city of lakes! Looking for the best places to see in Mysore? This guide has a list of great things to do in Mysore as well as the best cafes in Mysore and restaurant recommendations.